Having been promoted as champions of the second division the previous season Sunderland went into the campaign with their legendary manager Bob Stokoe in charge. In truth whilst everyone was excited at the prospect of being back up few of us really knew what was in store. Although it would end badly for Sunderland with relegation, looking back these few months almost encapsulated my Sunderland supporting life. We started the season brightly enough with 3 draws but it started to unravel pretty quickly at Ashton Gate where we were hammered 1 v 4. My mates went to that game, some of them are a bit older than me, and it wasnt a happy day both on and off the field. Crowd trouble outside was as always a feature of that time. We then lost to Middlesbrough and Manchester City, with the former being played at Ayresome Park in lashing rain. I remember fans urinating on the terraces as often happened that day and one poor lad not knowing about it until a warm sensation could be felt on the back of his leg! It was the 9th game of the season, following a 0 v 1 loss to Villa that Stokoe decided he had had enough. We had yet to win a game and the pressure told on the bloke. However it would not be the last we would see of The Messiah in the managerial hot seat. Ian McFarlane took over as caretaker for 7 games and although we won 2 of them, at Spurs and Coventry the football clubs hunt for a replacement for Bob came up with Jimmy Adamson, known primarily for his association with Burnley. Eight consecutive defeats later, after 23 games, we lay rock bottom of the table with just 9 points. However this period had witnessed one of my first away games outside of the North East with Sunderland. We went with the Travel club to Leicester City and for a lad in his last year at school I marvelled at the games of cards on the coach, drinking a few cans of beer and had my eyes opened up to the real world of the football fan. Although we lost 0 v 2 I went away with that day indelibly printed on my mind and a continuing love of Everards Ale. However what happened next will long live in Sunderland supporters memories. Something clicked. Goalless draws at home to Stoke City and away at Arsenal looked innocuous enough but it turned out to be a catalyst for one of the most remarkable comebacks in footballing history. 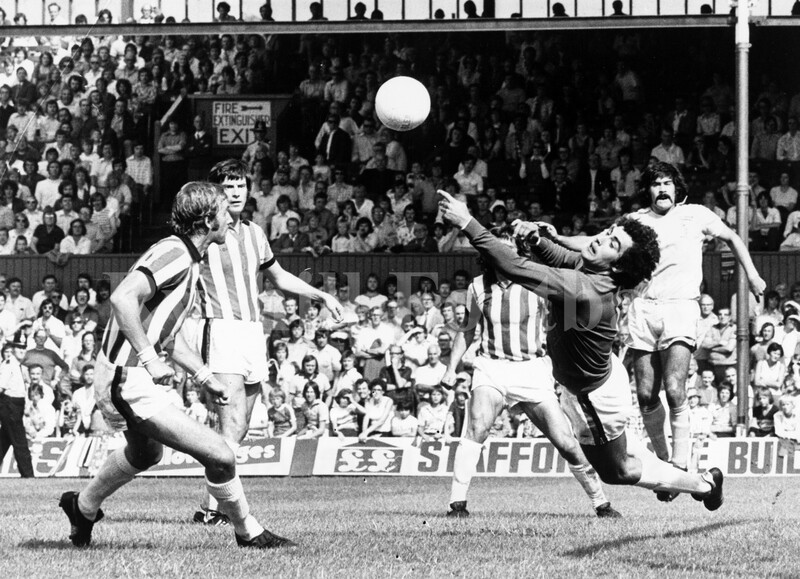 We defeated Bristol City at Roker Park 1 v 0. Mel Holden, who else was the scorer that day. No idea still why it was played on a Friday night although statcat gives the theory; mystery solved? We had won a game. not only that but we had scored a goal, our first in 11 games. I liked Mel Holden. His combination up front with Bob Lee was really the first I can remember in my time supporting The Lads. Tragic how it would turn out for him with his MS.
We then hammered Middlesbrough 4 v 0 and to this day I still say that it was one of the best performances I have ever witnessed from a Sunderland team. We steamrollered them. A midweek 6 v 1 victory over WBA followed to send the red and whites into ecstasy. I remember that game well. 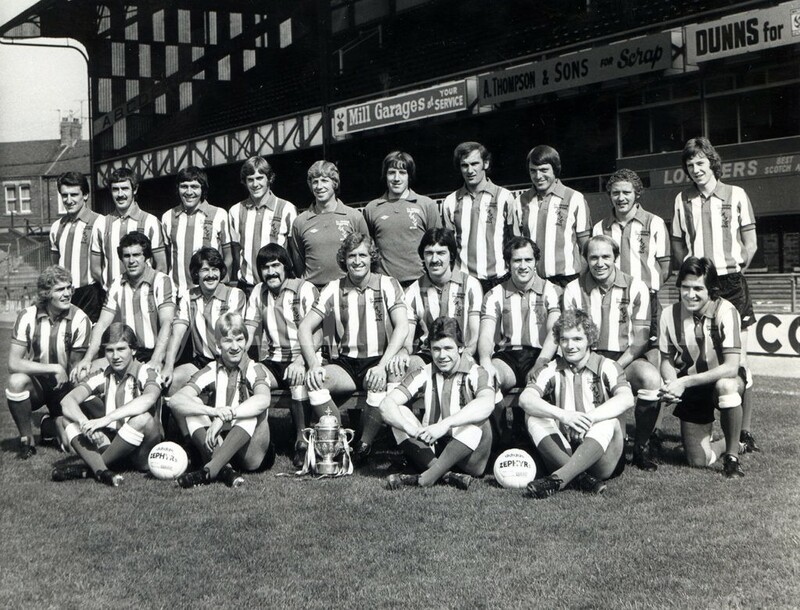 John Osborne was in goal for them and I was stood in the Roker End. After the 6th went in the ball went out of play and he came over to get the ball. He looked at me and my sister and said that we weren’t that good as their last opponents had put 7 past them! Cant remember who that team was. Never checked, wasn’t bothered. Someone will know. The following Saturday we played West Ham at home. I always liked playing The Irons. something about the club. Mind it was a very dodgy place to go at that time and there are a few stories from that era travelling away with SAFC that I will touch upon in future blogs. We were epic that day. Two nil up after 9 minutes we led 3 v 0 at half time and scored 3 more in the second half to blow WHU away. Mel had scored twice the same as a very young Gary Rowell. Could we possibly pull off the greatest footballing escape ever? We then lost at Manchester City. It was a night match and Sunderland were followed by 8,000 fans. We drove down to the match with my parents and got in late. We were just in time too see Mel score what looked like a perfectly good goal to give us the lead but it was inexplicably disallowed. Replays showed nowt wrong with it and in hindsight if that goal had stood we may well have stayed up. Coventry City (spit) and Bristol City would not have been able to do what they eventually did. We beat Bobby Robson’s high flying Ipswich team 1 v 0 and then travelled to Villa where we were hammered. Villa has always been our bogey team but I always loved going to Villa Park. I didnt go to this away game and I remember that after the game, a match that was on MOTD, the BBC going over to Barry Davies their match commentator on the match and as he delivered his post match verdict the camera panned to the thousands of red and whites who had been kept back in the ground. The songs and the emotion was palpable and he stopped his critique to wax lyrical about our fans; always the best bit about our club. I think Davies liked us. He was also the commentator at the Milk Cup Final in 1985 and once more at the end of the game and during it took time out to praise The Roker Roar. We then went on a run where we lost just 1 of our last 10 games, the last one to Everton. I remember every one of those games well, I went to them all and broke my heart when we went down. We beat QPR at home, they were doing well at the time. We then played The Mental Mags (as we called them at the time – as well as others things of course!) and played out a classic Tyne-Wear derby game in the sun. We led 2 v 0 and they rallied superbly to draw 2 v 2. It was a great game, marred of course by the obligatory crowd trouble. We then took up to 10,000 to Leeds (dependent upon which paper you read) and then defeated Man United 2 v 1. Arnott opened for us after 3 minutes, a Gordon Hill penalty saw The Red Devils draw level but another penalty, this time from Tony Towers gave us a win. All of the goals came in the first 20 minutes as I remember it. We then drew at White Hart Lane and once more took thousands down with 8,000 the estimate. We drew at home with Derby County before I attended one of my most memorable away games ever; West Bromwich Albion. What a day! Johnny Giles was the then player manager at The Hawthorns and the midlands side had a mercurial talent in Laurie Cunningham, who would eventually go to Real Madrid. Their side was packed with really good players, including Mick Martin who wold of course go on to be a commentator on BBC Radio Newcastle, someone who I got to know. A nice bloke. This game see sawed as “Tony, Tony Towers, England” gave us an early lead that was cancelled out by Cunningham. Bob Lee restored our advantage but David Cross once more pegged us back. Not to be deflated towers scored a 60th minute penalty to give us a great win. The last 20 minutes were agony and seemed to last 60 minutes. 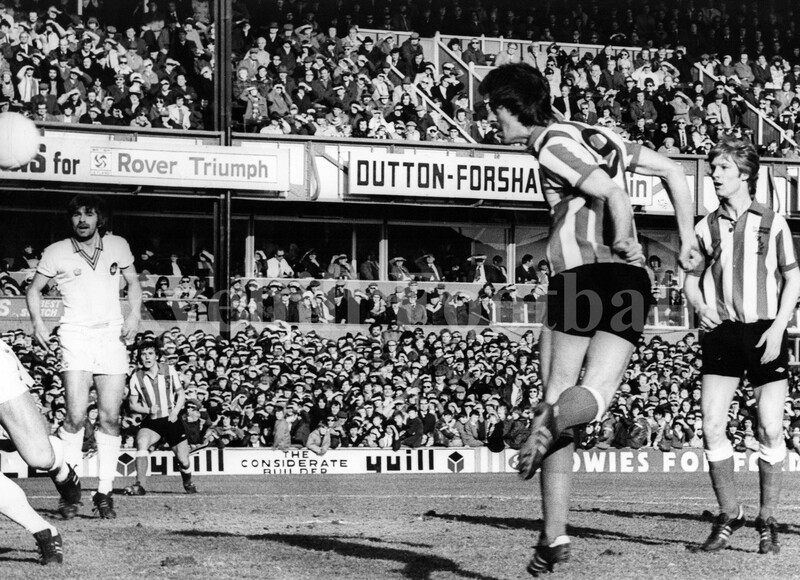 The Seaham Star Gary Rowell scores v Norwich City. What followed was bedlam on and off the terraces! There are however two stories from that day that live with me forever. 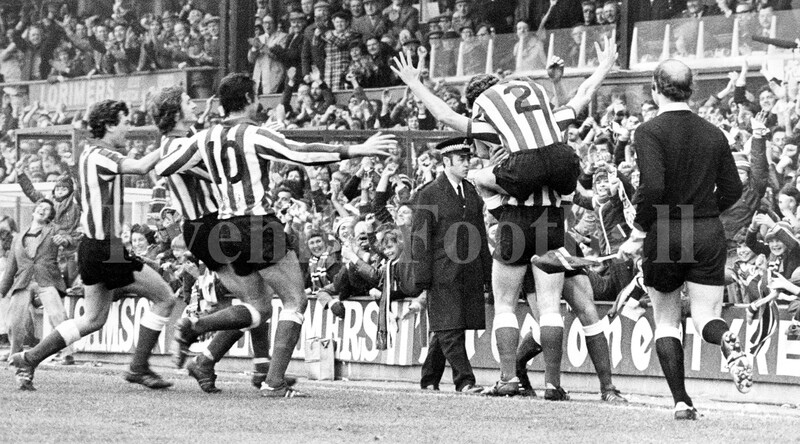 Before the game the Sunderland players piled into their refreshment hut and at that time it sold beer. It was mobbed and together with my mate Woody we struggled to the bar. The girl clearly flustered asked what we would like and Woody ordered 4 pints. she came back with them and then asked if there was anything else. “Yes” he said and proceeded to point to an item on the top shelf the furthest away from us. She left and with that he simply told me to pick up the pints and go. We did. After the game and Woody was clearly buzzing. We came out of the ground jumping and signing like daft buggers. anyway on the way down to the bus a strange thing happened. A bloke, looked very to-do with a sheepskin on and smoking a cigar started to tell us that we were “Geordie bastards” and that we had been lucky. Woody continued the conversation with him; it ended with the bloke being punched in the mouth and his cigar being spread all over his face. As irony would have it we met Woody’s Mother in the coach park, she had gone down with the SAFCFA; “are you warm enough; have you got enough to eat”, she said fussing over him like he was an innocent bit bairn. We were creased up. The next game was at home to Birmingham City; we won 1 v 0, then came 2 of the most epic Sunderland games I can ever remember. Ones to say “I was there”. Norwich City, Carrow Road, 14 May 1977. The game was played out in front of an overflowing near 28,000 crowd with Sunderland backed by a travelling army of 12,000 fans. They were all over the ground and our end was so full that lads were sitting on the rafters watching the game. We went down on the train, beer and tabs flowed, with talk of the Friday nights events out in the Town and the season so far. Everyone was up for it. At half time it was looking not too bad; 0 v 0, then it all started to unravel. with the Sunderland fans in full voice Kevin Reeves and then Viv Busby scored to give the Canaries what looked like an impregnable 2 v 0 lead. Then and as Sunderland fans started to stream out of the ground we rose, Phoenix like, from the ashes. There were just 7 minutes to go when Rowell scored to reduce the deficit. With 5 minutes to go Bobby Kerr equalised. It was complete pandemonium as our travelling fans started to run back into the ground after the first and both inside and outside the ground the scene was one of unbridled joy. We had given ourselves a fighting chance of staying up. 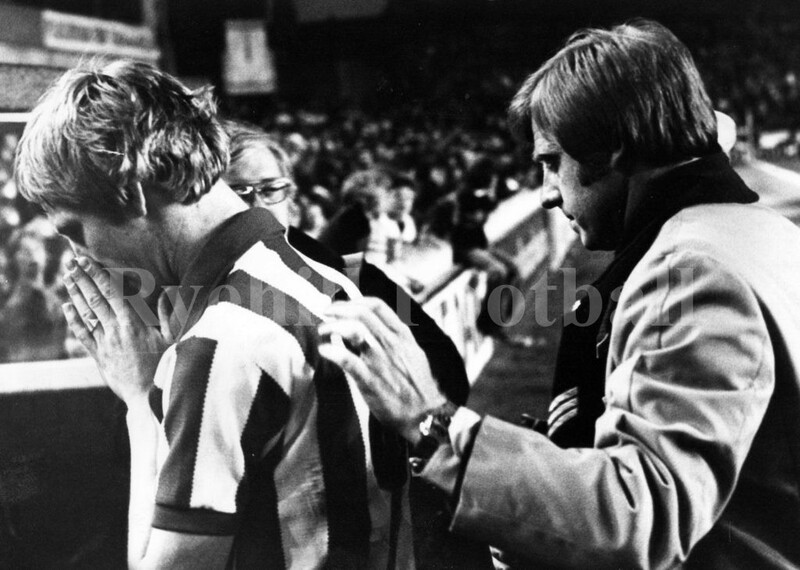 A distraught Shaun Elliott is consoled by Dave Merrington as they both leave the Goodison pitch following defeat at Everton and relegation. And so to the last game of the season and Goodison Park. By a miracle and some brilliant never say die performances it was now a simple process, avoid defeat and we were safe. We could even afford to get beaten if Coventry and Bristol City, playing at Highfield Road the same time produced a winner. The only combination we didn’t want was a Sunderland defeat, and a draw in the Midlands. The date was Thursday 19 May, Spurs and Stoke were relegated, Bristol City and Coventry were below Sunderland on goal difference. All 3 had 34 points. 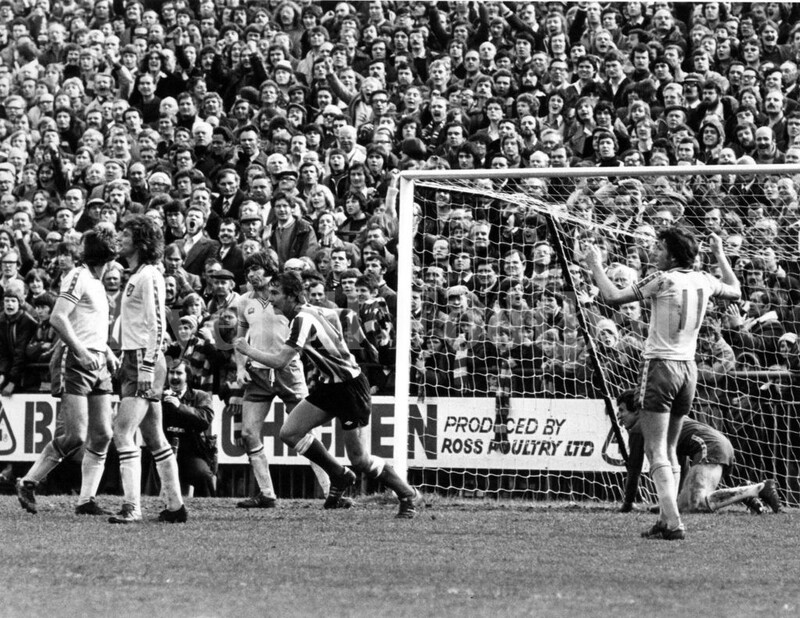 In a crowd of 36,075 Sunderland were represented by about 10,000 from Wearside, the atmosphere was electric. The performance however wasn’t and we lost 0 v 2, although the result was in dispute right up until Latchford scored in the last minute. But that wasn’t it, if Coventry or Bristol won then we were safe, we still had a chance. Unfortunately despite a plea for both games to kick off at the same time the game was mysteriously delayed due to “traffic problems”. By the time the news filtered through to Highfield Road (dramatically relayed to the players over the tannoy as the match progressed) they knew that a draw was good enough. The game of “passy the football” between the 2 teams that resulted was embarrassing. It ended 2 v 2 when City had been pressing for a winner. Once more the fates had conspired against Wearside. We were down after one season in the topflight; it was a choker. Alan Hardaker sent a letter of reprimand to Coventry after hundreds of letters of complaint landed on his Lytham St Anne’s desk. To no avail, it didn’t matter, it wouldn’t change a thing. The FA Cup had provided brief entertainment, but not much. Having been 2 down at home to cup giant killers Wrexham we battled back to earn a draw. The replay saw us succumb 0 v 1. The League Cup came and went, after a defeat of Luton saw the Lads come up short against Manchester United, again after two replays. Looking back on events we gave everyone too much of a head start. It gave us too much to do. It remains however one of my most memorable seasons following The Lads. I think its called “Character Building”. Excellent account of yet another emotional season!